Steel adapter plate, 1 in. thick is welded to three steel ties to provide foundation for bolting one-way or two-way hinged derail. No alteration of track is necessary. Plate accommodates all types of rail clips. Custom-sized derail is bolted to plate. Plate must be bought with a specially-sized derail. 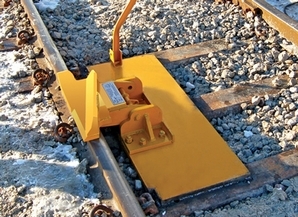 Derail is not included with base plate, order separately. Steel base plate and derail frame are custom-made to fit steel tie track and are not returnable once sold.